I was introduced to polenta when I was 15 and it took me one sauce-dripping bite to fall in love! I learnt to make it shortly afterwards and I’ll have you know it wasn’t that instant quick cooking stuff; it was the boil-for-45-minutes-stirring-continuously kind and it was so worth it. Admittedly I fluffed the bit where you pour it onto the wooden board the first few times and mostly it landed on the table & the floor but I soon got the hang of it and managed to fiddle a pretty decent well in the middle for the sauce. Today I’d only consider doing it this way if I’m going to cut the polenta into strips for deep frying or grilling purposes. 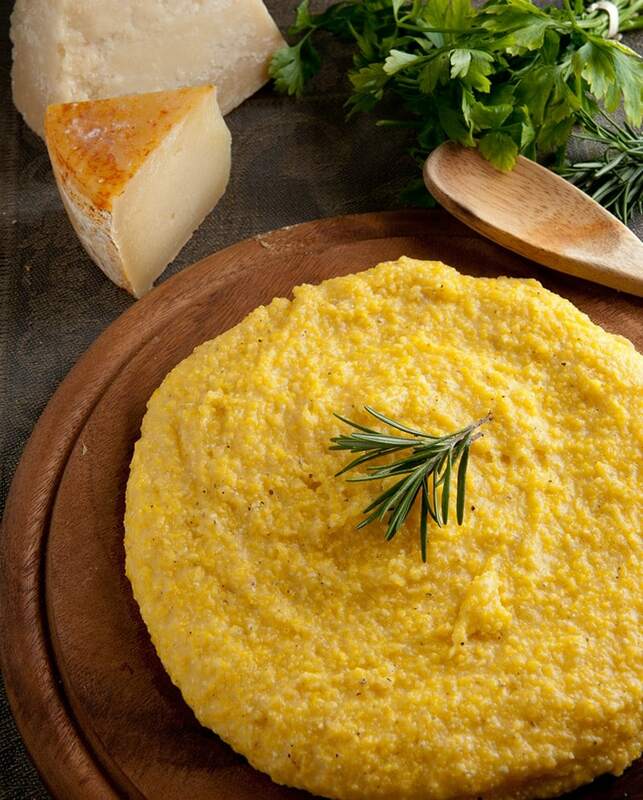 The word polenta comes from puls or pulmentum & it was the center of the Roman diet. In its earliest days, it was made from grain (usually millet or spelt) … as well as the cece bean (garbanzo bean or chick pea) flour…. it was not made from maize until hundreds of years later as corn itself was not introduced into Europe until 1650. Pulemntum was the staple food for Roman soldiers who subsisted on field rations of around 1 kg of grain & whatever else they could find. The soldiers would toast the grain on a hot stone, crush it and store it in their ruck sacks. Once they halted and constructed a bivouac, they’d grind the grain to a gruel-like consistency & boil it to make a porridge which they would either eat or allow to harden into a semi-leavened cake. 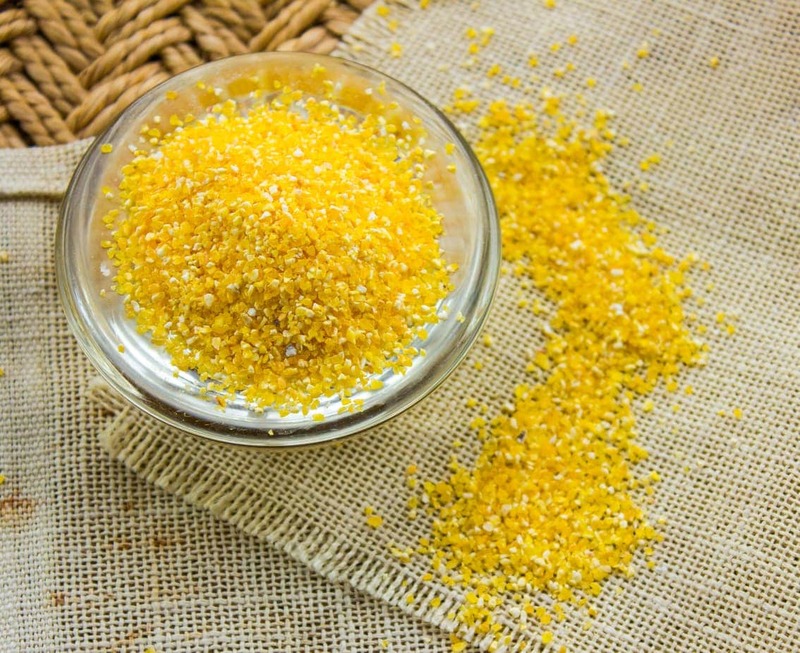 As time passed, the basic ingredients involved in the preparation of polenta changed as well: millet and smelt were replaced by barley & when general consensus considered barley was too bland, it was substituted with an ancient grain called far which was, apparently, more palatable. As milling methods improved, the crushed grains of pulmentum were processed into farina – the first genuine flour. Making polenta takes time, patience and attention; in the days of yore it was made a special copper pot that was kept near the fireplace & it was stirred with wooden stick (there are many traditions around the stirrer of the pot). I was taught to make it using ordinary yellow polenta flour and the general rule here is a liter of water for every 250 g of flour, but keep some boiling water nearby just in case. As soon as the water begins simmering, pour in the polenta flour slowly as if it rains (Italians say: a pioggia) & don’t stop stirring until all the polenta has been combined with the water; lumps are the enemy of polenta so if you have a good solid industrial type whisk, use it & to hell with tradition as long as you remember you’ll have to replace it with a good solid wooden spoon once the polenta thickens. As soon as it begins to show signs of thickening, turn down the heat immediately – if you neglect to do that you’ll be peppered with hot boiling liquid that sticks to the face; I speak from experience. Never stop stirring & keep an eagle-eye on your polenta (if it gets too thick, add some of the boiling water you have on hand) and stir constantly for the next hour until it’s thick and creamy and pulls away from the pot when you pull your spoon through the bottom. If you want a thick & firm polenta, stop adding water in the last quarter of an hour so that it thickens. Once the polenta is made, pour it on a wooden cutting board. Use the bottom of the biggest pot you have to spread it of the desired thickness. Let is rest for 5-10 minutes and with a kitchen knife cut it in strips and serve it with cheese or a ragù sauce. I’ve made polenta in my slow cooker and it works like a dream, grease your whole slow cooker generously with butter, then mix the polenta flour with cold water, using about 30% more water, add the salt, close the lid and cook according to the instructions for your cooker. If you feel you want to bake it, don’t. I tried that once because I hate standing in front of a pot for an hour and whilst it turned into a polenta, the texture was mediocre at best. For those of you who have an electronic paiolo (polenta pot), follow the instructions for an always perfect result. Bramata – a course maize meal which is great for rustic dishes and even greater for grilling; it’s very easy to get in most supermarkets. 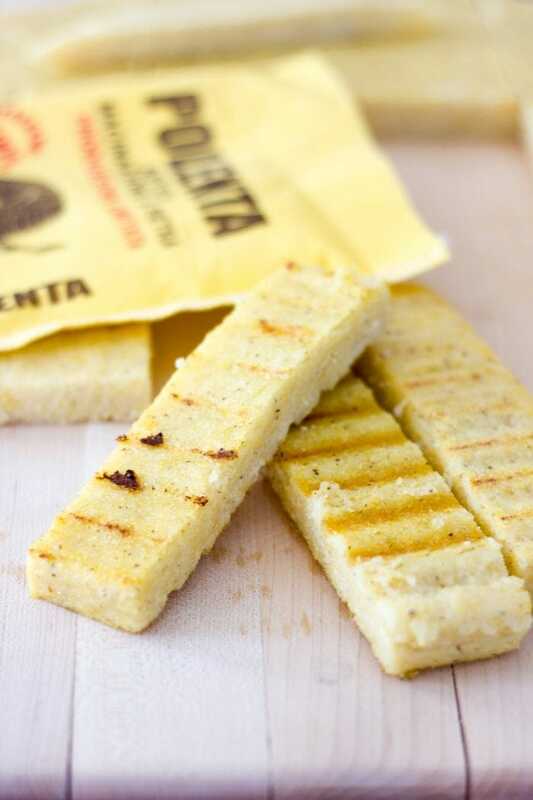 Fioretto – this is finely ground for polenta Bianca & often used in the northern parts of Italy. Taragna – available in Lombardia (where they also make the pizzoccheri) is made with maize flour and buckwheat and mostly served drenched in butter and cheese (often with sage) for a calories laden but rather delicious dish. If you find annoying the continuous mixing of the cornmeal, try this method. 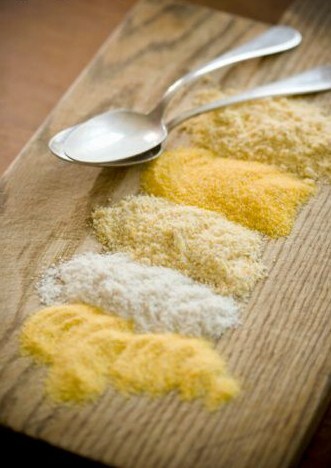 Boil a quantity of water 5-6 times the cornmeal. 600cc of water and 100g of cornmeal will generate a soft polenta, reduce the amount of water as needed to get a more compact outcome. Salt slightly, add the cornmeal and mix with a whisk. Put le lid on and cook for 2 hours at least, mixing every 30 minutes or so. The secret? A thick pot and a really low heat (use a heat diffuser).